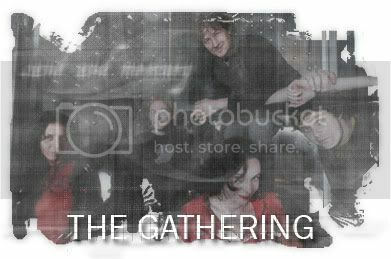 The Gathering • View topic - Info about the song "Travel"
Info about the song "Travel"
Post subject: Info about the song "Travel"
Is it dedicated to someone? It seems so, reading the lyrics. ...please tell me which person it is who “must have loved the colour of these violins” and whose “music was to stay forever”? Hans: W.A. Mozart, Anneke’s favorite composer. Wow thank you for the link . That'll keep me busy for some time . I didn't knew, but already thought it was about Mozart! Good guess. Wow, could someone please translate that to English? Reality isnt the things that you see, hear and feel, You see, hear and feel the things that you want to see, hear and feel. When You are look long into the Abyss, the Abyss also look into You. I always thought it was dedicated to a composer. But didn't know it could be Mozart. Anneke: A gentle and quiet number concerning a total dispossession. That can be of everything: music, love. René: You hear to the pilottracks of the instruments, because we it could this way no second time anticipate. Certain timingfoutjes is continue stand, but now give that net which correct environment. My jet ear has been voted here in c and has basgitaar-achtig a sound. The tamboerijn and percussion emphasise thoughtful environment. Anneke: This text I in the plane has also written and concerns flies. By inventions are we go as people free and stand where we want. But you sit one time in the plane, then feel you small, caught and suffocated. Something like that is very double. René: Great Ocean Road are complete long gone in Australia. Music feels exactly this way spatial. The sound of plane engines to the beginning comes from my jet ear, which I here in d has voted. I have used the instrumentje E-bow. It arouses magnet fields and gives a trembling sound; when you keep it at the snaren. The jet ear parties have been hunted by means of the computer by ten inch peaker, what causes the clattering sound. Anneke: An epic number, with as topic travelling in yourself. It is important for yourself learn know and work for everything where you have effort. Missing the wisdom at people who can help you, leathers of it and settle up with that where you sympathise yourself complete already walk around. Environment is sad, but also cheerful and hoopvol. René: The musical idea had I already during the Nighttime Birds toer. The first three tones is as a matter of fact jet ear noise what we did not get filtered. Theremin-solo give the ghostly sound and that sounds fantastically. None link this instrument in such a manner has used. Anneke: An old number of me. The acoustic jet ear parties I also myself have anticipated. It is a typical love song. The electricity which crackles between two people. The butterflies in your abdomen and the brief feeling. René: A real song. Simply short, with nicely clean Fender jet ear sound. Anneke: How feel it does a travel by making the space? Your zit in the ruimtecapsule, the Liberty Bell, leaves you and you see the sphere by the raampje always smaller become. Space travel is something like that powerful. René: A real tamping-bar. It lies a beetje in the line of "Strange machines" and for this reason we it as first single has chosen. Music himself has been based more on the film ' muffler boat ': propelling, imminent. It is exactly something like that as space travel, because your also sits locked up in a capsule. That suffocating feeling is present in music. Moreover want write I heavy a number. Furthermore you hear conversations between the astronauts. That has been drawn off of the computer documentary concerning Apollo 13. To the high piepjes to indicate the beginning and end of such a conversation. Those space conversations are moreover on sin-gleversie the eruitgeknipt and the number had be shortened. Red is a Slow Colour Anneke: The text is a metaphorical description of a nightmare which I have had, in which I a mental confrontation do not want contract. I have symbolised it as a black house where I naarbinnen go. Music gives a complete indringend feeling. It catches you and no longer leaves separately you. Rood means for me crawls, just like blood, and danger. René: Music is what dubreggae aimed, but then heavier. It is real wakkerhoudertje. There samples of violins sit and violoncellos in and on end sit the mellotron, which also Radiohead are used. The Big sleep Anneke: One of my favoriete numbers, because it has arisen from a jam and for this reason nicely sounds spontaneously. It is indeed Bjork-achtig, but that is something what sits also in me. It is a sleep song, but at the same time has it something macabre. You desire to sleeping, because you have a sleep lack, become yourself almost crazily of fatigue, until you fall eventually in sleep and will dream. René: This number has nothing shockerends. Environment is what psyhedelic. In the verte stipulated latches high sounded. Those produce I for my jet ear with a bow. That was a totally new experience and my jet ear now still sticks of that resin. Yes how do you come? That thing lay ordinary at Attie (Bauw) in the studio and I am that spontaneously will try out. I have also experimented with a bottleneck, e-bow with a bottleneck and bow with the bottleneck. Anneke: The small little boy who is not notable and is teased. It is no dramatic tale, but rather a beetje does not muse concerning former have been possible come with the others. Marooned mean left or on an uninhabited island touch. Hans Rutten the title has considered as a result of the film ' contact ' and that gave inspiration me. The refrain has also something melancholically. René: Can recognise itself everyone. You really only feel you, as it happens, always, however, a time. Music has been based on drumbeat with impact. Something what does link still little as a matter of fact, except in the sniffing hops. This number has fantastic dreigening by the rising tests. You hear crack pickupnaald on a plate and a xylophone achter-stevoren. Attie had also an old keyboard still such which you must vote to stand and we have tried out that also but. Anneke: This is the epos of CD one. It describes a travel by the time. I am ongelooflijke Mozartfan. People such as he, but also courts, were not competent in leading healthy nevertheless live and made them absolutely brilliant music. Mozart were its time far ahead. He eventual young has died to one or other narrow sickness and in a mass sepulchre thrown. Very sad. Meanwhile its plates are still twisted by many people. Such a genius admire I heal a lot. Music is emotionally and as heavy as the plague. René: A beautiful cooperation between the ideas of me and frank (Boeijen). Intro is starting up a computer and zipdrive for the sampler by each other gone. It is still extension of "Marooned", the nerd feeling, because those people frequently only communicate by means of the computer. There violoncellos and violins worry about. We have chosen for fade-out, to emphasise sad environment. Anneke: It starts with sample of a said rangerange range, but then reverse played, with afterwards a bit music from the original King Kong-film. It is no number for song lines, thus I have it what consonances with delay-effect kept. René: That puts down also the phantom feeling. Heavy the jet ears and the rising drums give an imminent environment. Just like the almost false, voorbijsuizende jet ear tones by E-bow and bottleneck. To the end langgepitchte didgeridoo only remain. Franc came incite with this title after our return trip of Mexico. Anneke: A very light number. Simply nice on an ASTRE sit and you nowhere busy concerning make. No war, no problems, nothing. It feels good and adventurously. René: No cell trick and man song therefore, such as we of plan were. It is this way already busy enough. The couplet sounds what dark, but the refrain is rather happy and easy. Creates nothing shockerends, ly and jet ear sound and chops on refreintjes. Anneke: Number also this I on akoustische the jet ear has written and has anticipated. The accoorden to be threatening, but by rolling mill rhythm, you hear that no longer. The topic is dark: a dictator who locks up people and assassinated. It intrigues me what handles there in such a sick spirit and I wonder myself how such a person feels himself. Music gives here feeling to blackmetal. Not this way heavy anticipated, but intense. René: This is our Black Sabbath-nummer. The number is of Anneke, but we the asls have filled in link heavy. The vibrating sound is the bass jet ear with an impactimpact impact. Anneke: A type review on the years fijftig, in which people had to strength massively for rebuilding work. It is fascinerend that has been done in certain periods in the history inventions and solicit massively has come about, also mental. René: Concerning the drums fat distortion sit. Furthermore the doorknetteren with my jet ear element are against the speakerkast to. That gives a deliciously sticky sound. Concerning the mandoline and the song we also but right have thrown distortion. The refrains bang from and hold course there against the stonerrock. Considerable buzzing and the jet ears loeihard. Anneke: No text therefore, only song consonances. The number exists already longer, but I had no inspiration for a text. The first what rose in me state on the CD. You must will sit really and go along with travel. René: The number lasts eventually wide twenty-eight minutes and from a jam has purely arisen. We have sit mix, whereas we looked at ' 2010 ' to pictures of the film. What you hear its mainly pilottracks. There also foutjes worry about. In the beginning my watch hears you moan. If you listen well you hear call Hans halverwege still certain things. Much have been worked with delay and gepeeld with volume, E-bow and bottleneck. I it a couple has let people hear. Became of it sick and the other one saw becoming itself launched and by the space to travel: the preparation, launching and it are in a job for the ground. There is no more radio contact, only noise consonances. At a given moment hear you samples of Russian cosmonauts. Hé, you have contact! But you do not return eventually to the ground. Everyone its own turn can give. The title is simply a question of frank: How do you measure access, the weight of a planet? In the notebooknotebook notebook the formula with explanation appears, instead of text. This is, however, most extreme what we do. I can designate no other Dutch link which it dares to to experiment this way. Many people find it perhaps a bad number, but yes, then have you still thirteen other beautiful numbers. hey great, where did you get these commects? and what was the native language of it? Can you post the untranslated text too? Hey, the Babel Fish! How come I didn't think about it? Anyway, it's great. Thanks for the information. Can someone please translate that interview? I was curious about it. It really is my favorite Gathering song to date and I can't wait to hear the live-version in Amsterdam, April 28th!! !